At my bridal shower back in November, I received a gift that I'd been wanting for a long time--an aebleskiver pan! 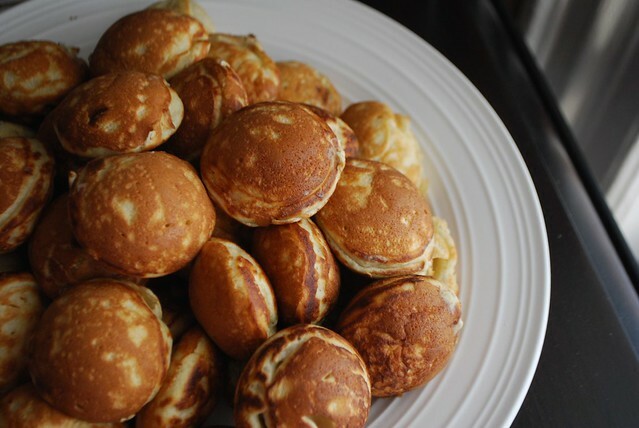 Aebleskiver are a Danish treat very similar in texture to an American pancake, but spherical in shape. They're basically little pancake balls, with a light and fluffy texture, traditionally filled with a piece of apple (hence the "aeble"), though more often served with jam and other types of fruit. In Denmark they're popular during Christmas time, when they are served as a dessert or snack, but here in the US, they're growing in popularity as a fun breakfast or brunch dish. The pan itself is made of cast iron with seven round wells on the surface. To make, a pancake-like batter is poured into the oiled well, and allowed to cook for a few minutes before a small amount of filling is added. A tool such as a chopstick, fork, or these fancy "turning tools" (which from looking at that picture I'm just now realizing I've been using upside down!) are used to delicately push and flip the pancake ball over within the well so that the bottom can cook. The result is a small little ball--about 2" in diameter--with a golden crust, light texture, and warm, gooey filling. These can be served with syrup or jam (lingonberry is popular), or simply dusted with a light shower of confectioner's sugar. Based on this description (stuffed pancake balls!?!) you can imagine how excited I was to try out my new pan, but the craziness of wedding planning took over and my pan was sadly relegated to the top of the pile of wedding presents in my living room corner. It wasn't until this past Sunday, when Eugene asked me if I could please make him those pancake balls I told him about. 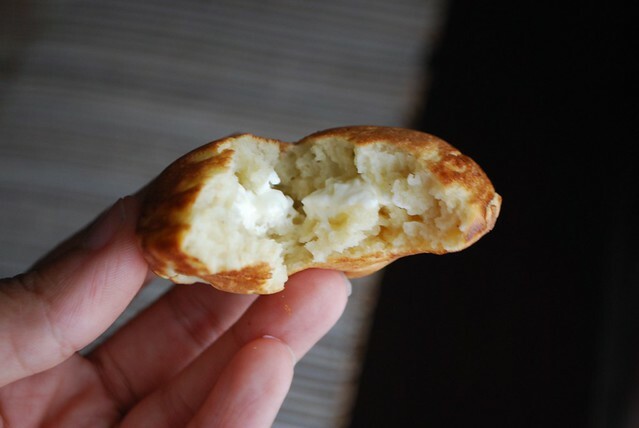 I decided to make cream cheese filled ones, because I've always loved the combination of warm, salty cream cheese melting inside a pancake topped with syrup. Growing up, my mom used to make us regular flat pancakes dotted with cream cheese and they were delicious, though messy to cook. I used a basic batter recipe, which I modified from the back of the box the pan came in. I was surprised and excited to find that they were really easy to get the hang of. In no time at all, I'd made about 40 of them and Eugene and I sat down to enjoy. The leftovers (and there were several since I made 40) were zipped into a plastic baggy and we've been enjoying them as a snack the past couple days. I was delighted to find that they taste good cold too (though they can also be reheated). My plan now is to try savory variations, which I think would make a great appetizer for a party--perhaps with bits of pulled, braised meat, or sun-dried tomato pesto and cheese or maybe even sauteed cabbage and vegetables (like a variation on an egg roll). I also have a churro version in mind--conceived while passing a vendor on the subway platform this afternoon--with a dab of dulce de leche in the center and then dusted with a sugar and cinnamon blend. Pure awesomeness! 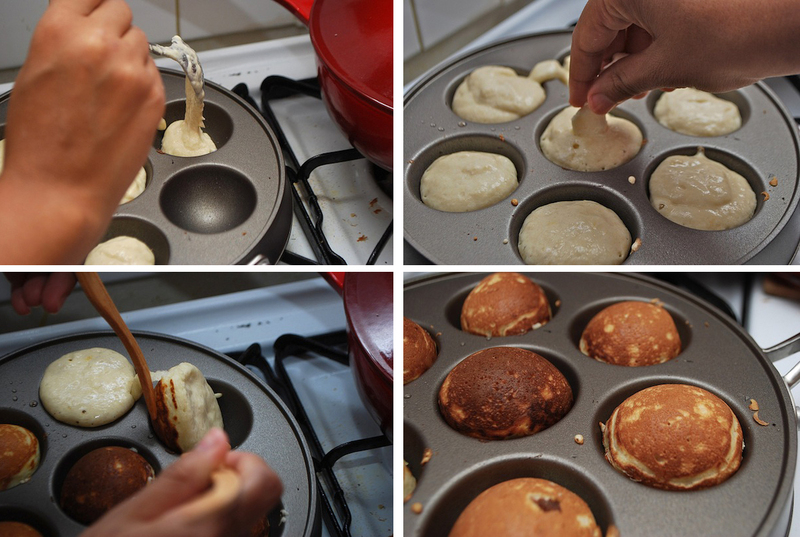 Have you ever tried or made any interesting aebleskiver variations? UPDATE: My friend Kristine, who is a food writer in Denmark, pointed out that in Danish, "Aebleskiver" means "apple slices." 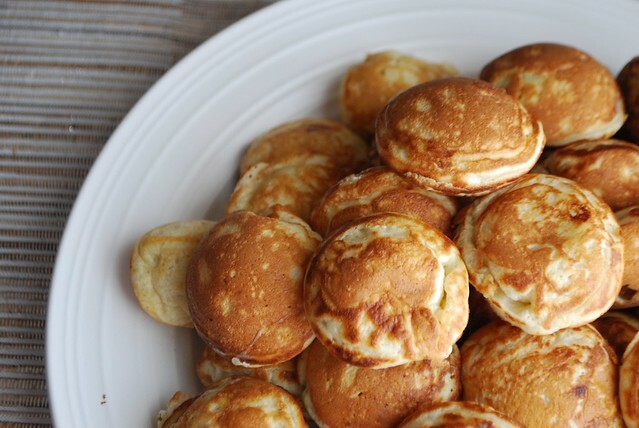 Which I just think is fabulous because how amazing is it to be able to say "Oh, I just had some apple slices for breakfast" and to have that *actually* mean delicious buttery pancake balls filled with jam and cheese? Very awesome, that's how. Whisk the egg yolks, melted butter, and sugar until well combined. Stir in the buttermilk, and set aside. In a separate bowl, sift together the flour, baking powder, baking soda, salt, allspice, and cinnamon. In a clean bowl (or mixer) beat the egg whites until stiff peaks form. Add the dry ingredients to the buttermilk mixture until well combined. Use a rubber spatula to gently fold in the egg whites. 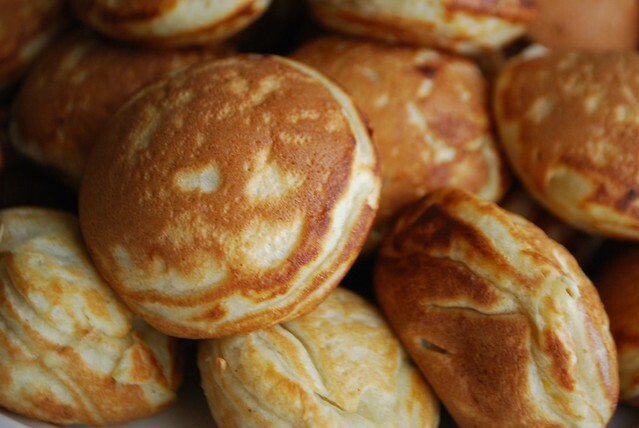 Heat the aebleskiver pan over medium high heat and add a 1/2 teaspoon of grapeseed or canola oil into each well. Once hot, pour in the batter until each well is 3/4 of the way full. If using a filling, add about a teaspoon to the very center and press in slightly. Let cook for about 1-2 to minutes until bubbles form on top and the edges look dry. Use a skewer, chopstick, or fork to push the cooked edge of the pancake to the center, gently nudging it along until it flips. If it's ready to turn, it will do so easily; if you have trouble, let it cook another 30 seconds or so and try again. You can use a second skewer to help it turn round. Let it cook for another 2 minutes until the bottom side is golden brown. Use a spoon or tongs to remove and set aside on a serving dish. Repeat with the rest of the batter. Cream Cheese Variation: Cut one block of cream cheese into 3/4 inch cubes and set aside. Pour the aebleskiver batter into the wells about 3/4 of the way full, then drop one cream cheese cube in the center of each pancake. Let cook for about 1-2 to minutes until bubbles form on top and the edges look dry. Use a skewer, chopstick, or fork to push the cooked edge of the pancake to the center, gently nudging it along until it flips. If it's ready to turn, it will do so easily; if you have trouble, let it cook another 30 seconds or so and try again. You can use a second skewer to help it turn round. Let it cook for another 2 minutes until the bottom side is golden brown. Use a spoon or tongs to remove and set aside on a serving dish. Repeat with the rest of the batter. Serve right away; leftovers can be reheated the next day in a hot oven.